A belated Happy New Year to everyone. Looking forward to making new friends and, of course, loads of lovely singing. There are no immediate choir events although arrangements are underway for the Food Festival, Shaftesbury Fringe and Gold Hill Fair together with a new community event on Castle Hill and, in case you think it had been forgotten, another “Slice of Song” at Amore. Watch this space. Tuesday 13 February Interest evening at Shaftesbury Arts Centre for anyone considering taking part in “Mack and Mabel”, this year’s summer musical. 7.30 p.m. See attached flier. Friday 16 February Grand Charity Quiz at the Olive Bowl in Gillingham. 6.30 p.m. for 7.00 p.m. See attached flier. There is information below concerning proposals to develop beyond Shaftesbury’s existing boundaries. If you want to have your say, then you will need to respond by 22 January. The actual response forms are difficult to interpret and even more difficult to fill in. No surprises there of course (!) but as a consequence, a simple guide to some of the questions has been prepared to get us all thinking. Do take some time to look at the proposals. 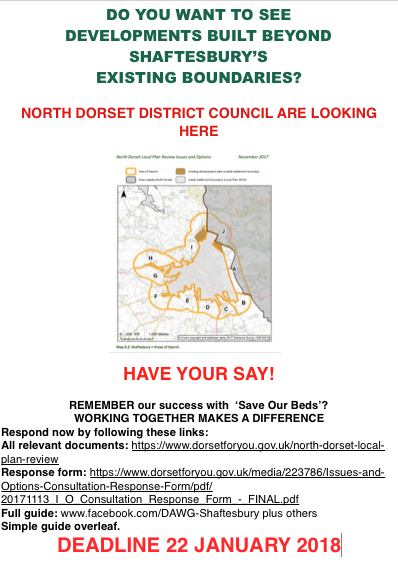 Working together really does make a difference – remember our success “Save Our Beds”? See below .. Suggestions for Shaftesbury residents. Other questions refer to the other North Dorset Towns and they may apply to you too.